With Guangzhou and Beijing as major hubs, China Southern Airlines covers all of China, radiating throughout Asia and with Skyteam partners provides convenient connections to all major cities in the world. Popular destinations on the China Southern Airlines network include Guangzhou, Beijing, Shanghai, Hong Kong, Delhi, London, Paris, Amsterdam, Los Angeles, Vancouver, Seoul and Tokyo, Istanbul, Moscow. China Southern Airlines is the largest airline in Asia.It operates over 440 modern aircraft and carries more than 80 million passengers to 168 cities in China, Asia and the World. Offering non-stop services from Sydney, Melbourne,Brisbane, Perth and now Auckland to Guangzhou. Our CANTON ROUTE from Australia to Europe is now flying direct to London and with our code share partners we offer over 40 European destinations via fabulous Guangzhou (Canton), stopover for Cantonese cuisine and amazing shopping. In November 2010, China Southern Airlines became the biggest carrier between Australia and mainland China, with non-stop services from Sydney, Melbourne, Brisbane, Perth and Auckland to Guangzhou. China Southern Airlines has been awarded a number of accolades including Best China Airline at the SkyTrax World Airline Awards in 2009, Best Business Class Airline in China 2010 by TTG China Magazine and World's Most Improved Airline at the SkyTrax World Airline Awards in 2011. 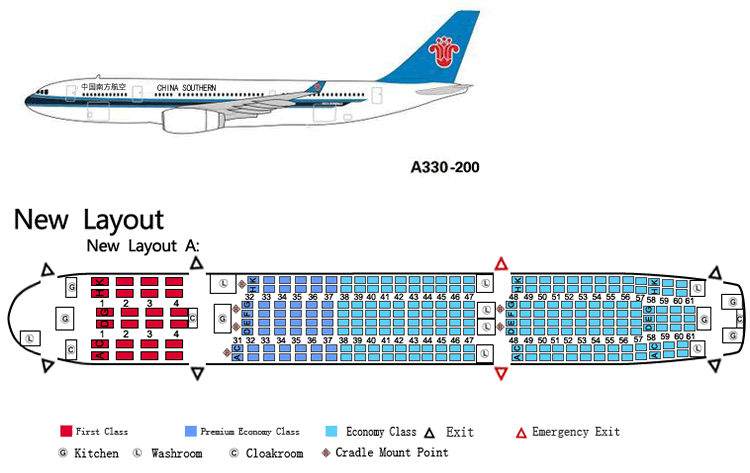 China Southern offers a very generous luggage allowance of 40kg of checked luggage in First and Business Class, 35kg in Premium Economy and 30kg in Economy Class as well as two pieces of carry-on luggage with a maximum weight of 5kg each. 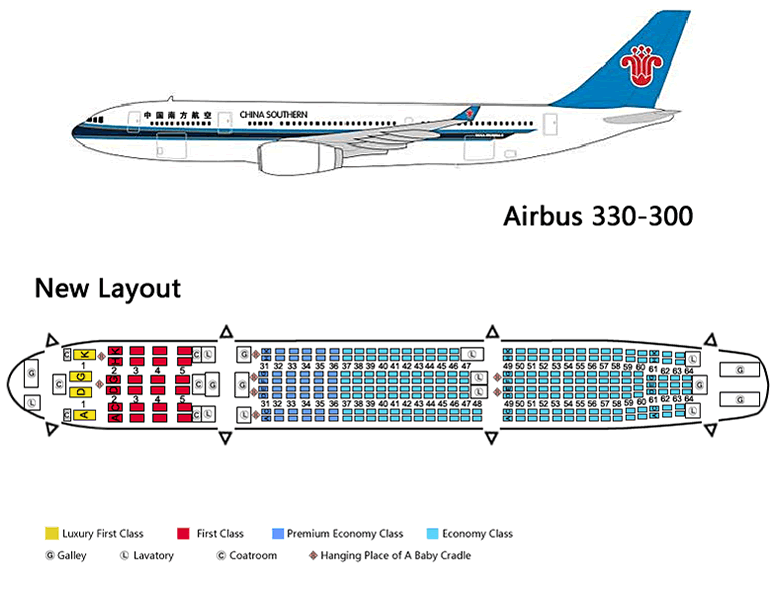 China Southern's Economy Class passengers enjoy a spacious seating configuration in the main cabin. The 17.5-inch wide, reclining seat features a 32-inch seat pitch. Menu selections include Chinese and international cuisine. Relax with a selection of movies and TV programs shown on screens spaced throughout the cabin and a range of music. 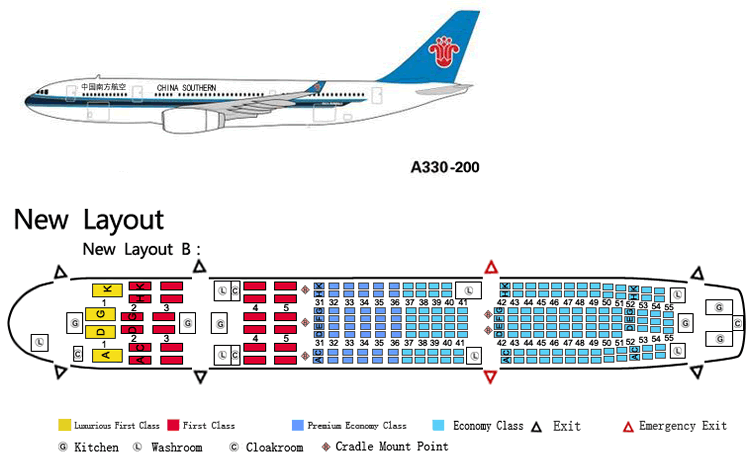 China Southern uses Airbus A333 and A332 aircraft on our Australia and China routes. Airbus A380 is also used throughout our international network. The 48-seat Premium Economy cabin features 17.5-inch wide seats that offer extra legroom with a seat pitch of 38 inches. 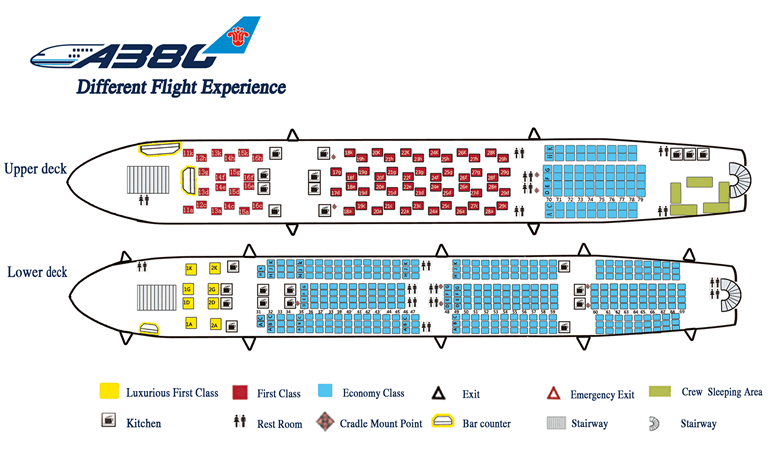 Business Class passengers enjoy a spacious 24-seat cabin in a 2-2-2 configuration. Seats are a comfortable 20 inches wide and 74 inches long. Relax in comfort with a 60-inch seat pitch and recline of 172 degrees. Refresh yourself during your flight with the branded amenities kit supplied for your comfort. Menu selections include Chinese and international cuisines complemented with fine French and Australian wines at your convenience, with on-demand service. Business Class seats offer a 10.4-inch personal LCD screen with Audio/Video on demand offering a selection of approximately 60 movies and 200 TV programs as well as 600 music titles. Experience the luxury of an exclusive 4 seat cabin laid out in a spacious 2-2 configuration. The 27-inch wide seats offer a seat pitch of 84 inches and recline to a 180-degree flat bed with a built-in massage function. A branded amenity kit is supplied to all passengers for your in flight comfort. Enjoy a15-inch personal LCD screen, with Audio/Video on demand offering a selection of movies and programs, with approximately 60 movies. 200 TV programs and 600 music titles available. Sky Pearl Club, China Southern's frequent flyer program, offers three levels of membership, Sky Pearl, Silver and Gold. It is free to join and allows you to earn miles on any China Southern Airlines flight or those of its SkyTeam partner airlines. Miles can be used for a range of rewards including free flights and upgrades. China Southern Airlines lounges are available in most cities in China. Guests can access Air New Zealand lounges at Sydney, Melbourne and Brisbane airports and Skyteam First and Business Class lounges elsewhere. China Southern Airlines is a member of the worldwide SkyTeam airline alliance, with SkyTeam members serving 886 destinations in 169 countries.